"For the day of the Lord draws near on all nations," Obad.15. As the 'Day of the Lord' draws near, few seem to be aware that this will initially bring an awesome time of adjustment upon all the nations. As to when this day will come and who it will effect are questions some in the Church, the Body of Christ, seem to ignore! Yet the coming end-time role of the Church will have great bearing on who this 'day' will effect, and in what manner? Much misunderstanding exists regarding the 'Day of the Lord', as to its timing and to its format. Some even ignore its reality! This booklet endeavours to see what scripture has to tell us about this 'awesome day'. The answers are of great importance. "For the day of the Lord is coming; surely it is near, a day of darkness and gloom, a day of clouds and thick darkness, (Joel 2:1b). As the "great and awesome day of the Lord" draws near it seems that few consider what scripture tells us about this future, perhaps imminent time. This booklet is written to try and see what scripture tells us about this ‘day’ so that we who are Christians are not in ignorance regarding it nor caught unawares by its soon arrival. That the ‘day of the Lord’ is referring to aspects of the second coming of the Lord, may not be in doubt, but a more precise understanding is more difficult to find. Some confuse this time with the ‘great tribulation’ and others are ignorant as to what this time refers. Whichever, it seems the reality of this ‘day’ is something that most Christians would prefer to ignore, possibly due the misconception that it is nothing to do with the Church or perhaps in not wanting to consider the horror and devastation which this ‘day’ appears to bring. Prophecies suggest that the ‘day of the Lord’ will be a day of judgement. But upon whom? Will any escape? And is this the end of the world? Ignorance, it seems, fuels speculation. However, as this time draws near, the ministry of the true Church, the body of Christ, will have much relevance to this coming judgement of God upon an increasingly unrighteous world, and so it is that a correct understanding of just what is, and when will be, the Day of the Lord, will become ever more important to understand. In the New Testament the phrase "day of the Lord" only occurs in Acts 2:20, 1Thess.5:2, 2Thess.2:2 (Note 1: The King James Version of the Bible renders the Greek text in 2 Thess. 2:2, as 'day of Christ' instead of 'day of the Lord'.) and 2Pet.3:10, but in the Old Testament it is found between thirty and forty times including Isaiah, Ezekiel, Obadiah, Joel, Amos, Zephaniah, Zechariah and Malachi. As one looks at these prophecies of scripture a clear picture can be obtained of just what this awesome time will bring. In Paul’s second letter to the church of the Thessalonians we see their lack of understanding regarding the ‘coming of the Lord’ created additional concern that "the day of the Lord Jesus Christ" had already come, (2Thess.2:1&2). From this it can be seen that we require a knowledge regarding the Lord’s second coming in order to answer our questions regarding the ‘day of the Lord’. Paul is clear in his teaching, that he did not want the saints of his day to be uninformed regarding the ‘coming of the Lord’ and just what this time will involve. Many Christians consider it is acceptable to remain in ignorance until this time arrives but this attitude seems contrary to the exhortation’s of Paul in this regard. Certainly our wrong expectations can produce much misguided effort amongst Christians. In many it produces misplaced hope. It is often forgotten that these future events are also our future. Peter’s letter to some of the ‘chosen’ in his day told them to "fix their hope completely in the grace to be brought to you at the revelation (the revealing) of Jesus Christ," (1Pet.1:13). The Holy Spirit is still not wanting us to be unaware of the unfolding plan and purpose of the Lord with whom we are joined. We also need to remember that this does not only apply to those who remain when the Lord comes but also involves all those who have "fallen asleep" in Jesus; His whole Church. The whole Church are involved in the day of resurrection and concurrent catching away of the saints, when the Lord returns in the clouds. What a day that will be! As we look at Paul’s first letter to the church of the Thessalonians he explains that we who are alive at the coming of the Lord will not precede those who have fallen asleep in Jesus. This hope, Paul says, should cause us not to grieve when any saint goes home to be with the Lord, as those do who have no hope, (1Thess.4:13-15). Paul explains that "the Lord Himself will descend from heaven with a shout, with the voice of the archangel and with the trumpet of God, and the dead in Christ will rise first, then we, who are alive and remain, shall be caught up together with them in the clouds to meet the Lord in the air," (1Thess.4:16&17). We see from this scripture that the ‘coming of the Lord’ will bring about the concurrent resurrection of the righteous dead and the catching away of those saints who are alive and remain on this amazing day. However, as we have already seen, it seems from Paul’s second letter to the church of the Thessalonians that they were confused as to whether this event had already taken place and they wondered if they had missed it! We can see from these letters that a lack of understanding of these future important events can have a present effect. It seems this lack of understanding was shaking their faith as there were reports from some that "the day of the Lord" had already come, (2Thess.1:2). So it was that Paul explained to them that this could not be the case unless certain other events (Note 2: Paul says that the falling away and the revealing of the man of sin, the lawless one whom the Lord will slay with the breath of His mouth [the beast] and bring to an end by the appearance of His coming, must come first, before the day of the Lord, [2 Thess. 2:3&8].) had already taken place. Only a correct understanding of Jesus’ second coming and its associated events could re-establish their hope and so it is with us. We also see from Paul’s letters to the church of the Thessalonians that the "coming of the Lord" for His saints coincides with that time which scripture describes as the "day of the Lord" as he mentions the latter in handling their concern regarding whether the former had already come: "With regard to the coming of the Lord Jesus Christ and our gathering together to Him, that you may not be quickly shaken from your composure or be disturbed either by a spirit or a message or a letter as if from us, to the effect that the day of the Lord had already come," (2Thess.2:1&2). The ‘coming of the Lord’ will usher in the ‘day of the Lord’. Paul also explains, this day will see separate effects upon two differing groups. He explains that "When the Lord Jesus shall be revealed from heaven with His mighty angels in flaming fire," ("when He comes to be glorified in His saints on that day") the angels will be "dealing out retribution to those who do not know God and to those who do not obey the gospel of our Lord Jesus," (2Thess.1:7,8&10). Paul says that there are "those in darkness" and those who are the "sons of light and day," (1Thess.5:4&5), explaining that for "those in darkness" the ‘coming of the Lord’ will be "just like a thief in the night," (1Thess.5:2), but for those "not in darkness" it will not overtake them "like a thief," (1Thess.5:3-5). We who are sons of light are not meant to be unaware. The Greek word for ‘coming’ is ‘parousia’, and we often hear this Greek word being used when Jesus’ return is being referred to. It is a word that suggests both an arrival and a consequent presence with. (Note 3: See Expository Dictionary of Bible Words by W.E. Vine) When used in relation to the return of Christ it seems to suggest not only His momentary coming for His saints but His presence with them from that moment. The Bible tells us much about the ‘coming of the Lord’ but so often the scriptures in this regard are not rightly divided. For example, there is a clear distinction between the Lord "coming in the clouds" for His saints and a later ‘coming to the earth’ with His saints, that is often misunderstood. Paul specifically tells the church of the Thessalonians that our being caught up to be with the Lord in the air is ‘in the clouds’, (1Thess.4:17); a phrase that we find in Scripture to refer to this first aspect of the Lord’s second coming. And this is not any secret coming, as some suggest, for we read in the ‘Revelation’, "Behold, He is coming with the clouds, and every eye will see Him, even those who pierced Him; (Note 4: Comparing Zech. 12:10 with this verse it seems that 'those who pierced' Jesus is a reference to natural Israel who will not all be saved before the coming of the Lord.) and all the tribes of the earth will mourn over Him, (Rev.1:7). We recall when Jesus ascended to heaven, after appearing to his disciples for forty days after His resurrection, that whilst the disciples looked on, a cloud received Him out of their sight. As this took place two angels declared, "This Jesus, who has been taken from you into heaven, will come in just the same way as you have watched Him go into heaven," (Acts1:9&10), i.e. on a cloud! Even Daniel makes mention of the clouds when he prophesied of Jesus’ second coming: "Behold, with the clouds of heaven One like the Son of Man was coming," (Dan.7:13). In this way the Holy Spirit enables us to divide the twofold aspect of the second coming of the Lord. Whilst the purpose of this booklet is not to discuss the time before the Lord’s return a brief outline is required. For us to correctly place the ‘day of the Lord’ and the concurrent ‘coming of the Lord with the clouds’ in its correct sequence of events we can look at Peter’s first sermon where he quotes from the prophet Joel, saying, "I will grant wonders in the sky above, and signs in the earth beneath, blood and fire, and vapour of smoke; the sun will be turned to darkness and the moon into blood before the great and notable day of the Lord shall come," (Acts 2:19&20 and Joel 2:30). Jesus tells us that it is immediately after the ‘great tribulation’ that the "sun will be darkened and the moon will not give its light," when the "powers of the heavens will be shaken, and the "sign of the Son of Man will appear in the sky, and then all the tribes of the earth will mourn and they will see the Son of Man coming on the clouds of the sky with great power and great glory," and the angels "will gather His elect from the four winds, from one end of the sky to the other," (Matt.24:29-31). The ‘great tribulation’ is often confused with the coming ‘wrath of God’ but these are separate events. The ‘great tribulation’ (Note 5: That tribulation and distress does not continue upon all nations beyond the coming of the Lord, is not in doubt, but the scriptures do not use this term again once the 'day of the Lord' arrives. A demarcation, therefore, between the period before the Lord returns and the period making up the 'day of wrath' needs to be made.) is caused by Satan having great wrath and precedes the ‘day of the Lord’. The Church will go through the ‘great tribulation’ whereas it will be caught away before the ‘great and terrible day of the Lord’. Jesus told us that the "great tribulation, such as has not occurred since the beginning of the world" until then "nor ever shall", comes after the "abomination of desolation, which was spoken of by Daniel the prophet," is seen "standing in the holy place," (Matt.24:15&21). We see from these scriptures that the ‘great tribulation’ will occur before Jesus second coming which in turn will bring in the ‘day of the Lord’ in which "God’s righteous judgement" will come upon all those "who do not know God," (2Thess.1:5-8). This is the clear order of events that we find in scripture. Although many Christians confuse the ‘great tribulation’ with the ‘day of the Lord’, if we examine the scriptures carefully we will see that they are very separate events. Scripture never describes the ‘great tribulation’ as the ‘day of the Lord’ but indicates that the ‘great tribulation’ precedes the ‘coming of the Lord,’ which in turn will see the commencement of the ‘day of the Lord’. We have ascertained that when the ‘day of the Lord’ begins, the saints, those who have fallen asleep in Jesus, have been raised from the dead and those who remain at His coming are caught up together with them to be with the Lord in the clouds. The events, therefore, that scripture describes as occurring on the ‘day of the Lord’ fall upon those who will remain on the earth at this time and not on those who are to join the Lord in the air. For this reason it does not there immediately effect the Church. Jesus also tells us that on this ‘day’, it will be just as it was in the time of Noah; people will be drinking, marrying, buying and selling, planting and building, and just as it was in the time of Lot, when they were eating and drinking, buying, selling, planting and building, (Note 7: 'Marrying' is not mentioned in the time of Lot, for Lot was in Sodom where homosexuality was rife!) (Luke 17:26-28 and Matt.24:37&38). In telling us that this ‘day’ will be "just as it happened in the days of Noah", and "the same as happened in the days of Lot", (Luke 17:26&28), Jesus was not indicating that there would only be a few saved, as some suggest, but rather that those who were unrighteous - those not of the light - would be taken unawares, life continuing much as normal and, like a thief, sudden destruction would come upon them. As Paul explains to the church of the Thessalonians, this is the ‘day’ when they will be saying "‘Peace and Safety!’ Then destruction will come on them suddenly like birth pangs on a women with child, and they shall not escape," (1Thess.5:3), telling them also that "God has not destined us (who are sons of light and sons of day) for wrath, but for the obtaining of salvation through our Lord Jesus Christ," (1Thess.5:9). Jesus explains that "the day that Noah entered the ark the flood came and destroyed them all" and that "the day Lot went out from Sodom it rained fire and brimstone from heaven and destroyed them all," so "it will be just the same on the day the Son of Man is revealed," (Luke 17:26,28&30). Jesus’ second coming is going to bring judgement upon the world. However, we will obtain confirmation by studying other prophecies that unlike the time of Noah and Lot, not everyone who is left on the earth will be destroyed. It is only the unexpected nature for those "of darkness" and the reality of the destruction and wrath that will come that is common between the ‘day of the Lord’ and the days of Noah and Lot. Nevertheless, we who are "of the day" should take note of Paul’s exhortation to "not sleep as others do, but let us be alert and sober... having put on the breastplate of faith and love, and as a helmet, the hope of salvation," (1Thess.5:6&8). This agrees with the words of Jesus to "be on the alert, for we do not know which day our Lord is coming," urging us to be "like the faithful and sensible slaves whom his master put in charge of his household to give them food at the proper time," (Matt.24:42-45), that He might find us "so doing when He comes," (v.46). Will We Know when the Lord’s Second Coming is getting Near? Some suggest that because Jesus told us that "of that day and hour no one knows, not even the angels of heaven, nor the Son, but the Father alone," that this ‘day’ will be unexpected for us all, even Christians who are alive at that time, but they overlook that the Lord at the same time exhorted us to "learn from the parable of the fig tree" which enables us to know the season, (the month and year), as when a fig tree "puts forth its leaves, we know that summer is near," (Matt.24:32). Jesus told us that when we see the events which would precede and bring forth His "coming on the clouds", those events He had just prophesied, He told us to note that when we "see all these things," we are to "recognise that He is near, right at the door," (Matt.24:33). Jesus has told us of the events which indicate His soon return. We might not know the day nor the hour but we will know the season if we are alert in order that the day "should not overtake us like a thief," (1Thess.5:4). For this reason we should be ready and prepared. Jesus told us, "When these things begin to take place, straighten up and lift up your heads, because your redemption draweth nigh," (Luke 21:28), for "when we see these things (which He had just prophesied) happening" we are to "recognise the Kingdom of God is near," (v.31). This is a very different picture to that which many describe, of a sudden unexpected and even secret "catching away of the saints" or ‘rapture’ before the "great tribulation," which they wrongly equate with the ‘day of the Lord’. Those who hold to these beliefs, as perhaps the majority of Christians do at this time of writing, wrongly divide these prophecies of scripture or seem content with being unaware! But Peter, even in his first sermon, indicates the nature and span of the ‘Church Age’ when quoting from the prophet Joel, telling us that the Spirit would be poured out upon all mankind "before the day of the Lord," also quoting Joel prophesying that during this time "everyone who calls upon the Name of the Lord shall be saved," (Acts2:17&21). In the prophecy by the prophet Joel he describes the ‘day of the Lord’ as "awesome" whereas Peter, in his first sermon, quoting from this passage from Joel’s prophecy, describes the ‘day of the Lord’ as "notable" or "glorious", (Acts 2:19&20 and Joel 2:30). The Greek word for ‘notable’ is ‘epiphanês’, meaning ‘illustrious or renowned’. (Note 8: See Expository Dictionary of Bible Words by W.E. Vine.) This description suggests that at the time when Peter preached his first sermon, on the ‘first Pentecost’, this ‘day’ was well known because of the many references to it by the Old Testament prophets. But as to its timing amongst other events it seems that much less was known; a timing we are able to schedule from the prophecies of Jesus and the writings of Paul, an advantage we, who find ourselves living at the end of this age, have. To build up a picture of this mighty future event, however, we still need to look at the prophecies of the Old Testament prophets. Obadiah prophesies that the "day of the Lord draws near on all the nations. As you have done, it will be done to you. Your dealings will return on your own head," (Obad.15), but says that "on Mount Zion (Note 9: When interpreting prophecy of scripture many spiritualise all references to Zion, interpreting this to only be a reference to the Church. It is true that we who have come to ‘know Christ’ have come to "Mount Zion and the city of the living God, the heavenly Jerusalem," (Heb.12:22). However, Zion, is one of the hills on which Jerusalem stood, and was the place which David named as the "City of David" (2Sam.5:7 and 1Chron.11:5). Much misunderstanding of prophesy can result from spiritualising all prophecies of scripture and attributing prophecies regarding natural Israel to the Church. Although in the spiritual realm a heavenly Jerusalem now exists, we must not forget that the earthly Jerusalem does too. Rightly dividing scriptures in this respect is essential.) there will be those who escape, and it will be holy," (v.17). Obadiah particularly prophesies that "there will be no survivors of the house of Esau but concludes that in this ‘day’ "the kingdom will be the Lord’s", (v.18&21). We begin to realise that the ‘day of the Lord’, whilst bringing judgement, will also inaugurate the millennial reign of Christ. Amos tells us that the ‘day of the Lord’ will be one of misplaced hope for many, saying, "Alas, you who are longing for the day of the Lord, for what purpose will the day of the Lord be to you? It will be darkness and not light... will not the day of the Lord be darkness instead of light," (Amos 5:18&20). Amos urges the house of Israel to "Seek the Lord that you might live," (v.6), telling them to "seek good and not evil," indicating that "perhaps the Lord God of hosts may be gracious to the remnant of Joseph," (v.14&15). There were many who were at "ease in Zion" (Amos 6:1) and had not "grieved over the ruin of Joseph," (v.6). Amos prophesies that the Lord would "shake the house of Jacob among the nations", (Amos 9:9), but "nevertheless, I will not totally destroy the house of Jacob," (v.8). Just as with Israel of old, many Christians in this day are "at ease in Zion"! We desperately need to beware and stir ourselves up. Amos foretells that a ‘day’ was coming when God would "raise up the fallen tabernacle of David and wall up its breaches" and "raise up its ruins and rebuild it as in the days of old," (v.11), restoring "the captivity of His people Israel" and "planting them on their land," when they "will not again be rooted out of their land which He had given them, (v.14&15). This clearly indicates that the ‘day of the Lord’ will also introduce Israel’s restoration. Some are looking for natural Israel’s restoration before the coming of the Lord, however, but it will not come until Jesus returns to the earth after the awesome judgements of the ‘day of the Lord’. The prophet Isaiah foretells of Israel’s restoration, telling us that it will be "in the last days" when the "mountain of the house of the Lord will be established as the chief of mountains... and all the nations will stream to it... to the house of the God of Jacob, that He may teach us concerning His ways and that we may walk in His paths, for the law will go forth from Zion and the word of the Lord from Jerusalem, and He will judge between the nations" when they "hammer their swords into plowshares and their spears into pruning hooks" and "nation will not lift up sword against nation," (Is.2:2-4). Clearly Israel’s restoration happens when Jesus is in their midst but before this time of restoration Isaiah also prophesies of the "day of reckoning", (v.12), bringing forth judgement as the reality of this awesome ‘day’ which will come suddenly upon our sinful world: "For the Lord of hosts will have a day of reckoning against everyone who is proud and lofty," a ‘day’ that Isaiah describes as the "terror of the Lord," (Is.2:12,19&21). Then speaking of Jesus’ millennial reign, Isaiah prophesies, "in that day the Branch (Note 10: Many times in prophecy the ‘Branch’ is obviously referring to Jesus, (Is.11:1; Is.53:2; Jer.23:5; Jer.33:15; Zech.3:8 and Zech.6:12) - the ‘Branch’ is Jesus.) of the Lord will be beautiful and glorious and the fruit of the earth will be the pride and the adornment of the survivors of Israel," (Is.4:2). The reference to "survivors of Israel" agrees with other scriptures that tell us that it is only a remnant (Note 11: Paul quotes from Isaiah in his letter to the Romans, saying, "Though the number of the sons of Israel be as the sand of the sea, it is the remnant that will be saved," (Rom.9:27 and Is.10:22).) of Israel that is saved. Isaiah tells us that only "he who is left in Zion and remains in Jerusalem... when the Lord has washed away the filth of the daughters of Zion and purged the bloodshed of Jerusalem from her midst by the spirit of judgement and the spirit of burning," (Is.4:3&4), will be "called holy". The prophecies of Isaiah tell us that it is following a time of God’s wrath being poured out upon the earth that there will commence the millennial rule of Jesus as King over all the earth; a time when "the Lord will create over the whole area of Mount Zion and over her assemblies, a cloud by day, even smoke, and the brightness of a flaming fire by night; for over all, the Glory will be a canopy," (Is.4:5). But first Isaiah declares, "Wail, for the day of the Lord is near... behold, the day of the Lord is coming, cruel with fury and burning anger..." when the "sun will be dark when it rises and the moon will not shed its light. (Note 12: See Matt.24:29, Acts 2:19&20 and Joel 2:30) Thus I will punish the world for its evil and the wicked for their iniquity," (Is.13:6-11). Before the Lord will come to the earth as its King we must note that there is a time of great wrath coming upon this wicked and evil world. This will be the time when He will "put an end to the arrogance of the proud and abase the haughtiness of the ruthless," (Is.13:11). "The earth will be shaken from its place at the fury of the Lord of hosts in the day of His burning anger," (v.13). Who will warn this present generation, however, and declare the way of escape? Speaking of this time of God’s "burning anger" Zephaniah describes the ‘day of the Lord’ as the "day of the Lord’s sacrifice," (Zeph.1:8), going on to say, "Near is the great day of the Lord, near and coming quickly; Listen, the day of the Lord! In it the warrior cries out bitterly. A day of wrath is that day. A day of trouble and distress, a day of destruction and desolation, a day of darkness and gloom, a day of clouds and thick darkness, a day of trumpet and battle cry against the fortified cities and the high corner towers. And I will bring distress on men so that they will walk like the blind because they have sinned against the Lord. And their blood will be poured out like dust and their flesh like dung. Neither their silver nor their gold will be able to deliver them on the day of the Lord’s wrath; and all the earth will be devoured in the fire of His jealousy," (Zeph.1:14-18). With this stern prophecy the prophet exhorts, "Before the day of the Lord’s anger comes upon you, seek the Lord all you humble of the earth who have carried out His ordinances; seek righteousness; seek humility. Perhaps you will be hidden in the day of the Lord’s anger," (Zeph.2:2&3). Perhaps it is through Joel, more than any of the other Old Testament prophets, that we find out more detail about the ‘day of the Lord’. The "day of the Lord," he says, "will come as destruction from the Almighty," (Joel 1:15), and tells us it is "a day of darkness and gloom; a day of clouds and thick darkness," (Joel 2:2), warning us that "The day of the Lord is indeed great and very awesome and who can endure it?" (v.11). Joel goes on to describe a particular and most awesome event in some detail: "As the dawn is spread over the mountains so there is a great and mighty people; there has never been anything like it, nor will there be again after it to the years of many generations. (Note 13: From this we realise that life will go on after the awesome judgements that commence the ‘day of the Lord’, going on, of course, during the millennial reign of Christ upon this earth.) A fire consumes before them, and behind them a flame burns. The land is like the garden of Eden before them but a desolate wilderness behind them, and nothing at all escapes them. Their appearance is like the appearance of many horses; and like war horses, so they run with the noise of many chariots. They leap on the tops of the mountains like the crackling of a flame of fire consuming the stubble. Like a mighty people arranged for battle. Before them the people are in anguish. All faces turn pale. They run like mighty men; they climb the wall like soldiers and they march in line. Nor do they deviate from their path. They do not crowd each other. They march everyone in his path when they burst through the defences. They do not break ranks. They rush on the city, they run on the wall. They climb into houses. They enter through the windows like a thief. Before them the earth quakes, the heavens tremble, the sun and the moon grow dark and the stars loose their brightness," (Joel 2:2-10). There are in fact interpretations of this prophecy found amongst Christians which suggest this prophecy of Joel’s refers to an end-time army of God’s people, the Church, during the "great tribulation," but Joel is describing an event during the ‘day of the Lord’ after the ‘great tribulation’. Joel tells us it is God’s army, saying, "And the Lord utters His voice before His army; surely His camp is very great, for strong is He who carries out His word! The day of the Lord is indeed great and very awesome and who can endure it?" (Joel 2:11). We see a similar picture painted for us by John in the book of Revelation where he saw locusts released from the bottomless pit to torment those without the seal of God on their foreheads for five months; men seeking death at this time but unable to die. These locusts, John describes, were like horses prepared for battle and the sound of their wings was like the sound of chariots of many horses rushing into battle, describing the army in similar ways to the way Joel does, (Rev.9:1-12 and Joel 2:4). This event is described in the book of Revelation as the first "woe" of the day of God’s wrath. This prophetic vision describes a judgement from God which will occur during the ‘day of the Lord’, the day His wrath. For us to spiritualise it and apply it to the Church and a different time cannot be right. John also sees another judgement which involves other horsemen; an army of two hundred million sent out by God to kill one third of mankind!!! (Rev.9:13-21), but this doesn’t seem to be the particular event that Joel prophesied. As we look at these awesome judgements which are coming upon the earth it seems we have not dared to even consider their horror and the mighty judgement that is laid up and prepared by God as a retribution which will take place before Jesus actually comes to rule upon the earth. Are we even able to contemplate such awesome judgement from Almighty God? Is our understanding able to cope with such a future? Yet Joel is clear in prophesying of this "great and very awesome day of the Lord!" Too often we find the aspect of God’s judgement and righteous anger is ignored by Christians today, suggesting that in His great love even sin can be pass over. Of course, it can’t! The last book of the Bible, from which we have already quoted, is the Apocalypse, or Revelation. It is "the Revelation of Jesus Christ which God gave Him to show to His fellow servants, the things which must shortly take place" and which "He sent and communicated by His angel to His bond servant John." The images it portrays are such that we find them difficult to cope with but it is in the book of Revelation that we find the greatest amount of information about the coming time when God will pour out His wrath at the onset of the ‘day of the Lord.’ The book of Revelation also tells us much about the time that precedes the day of wrath when there will be ‘great tribulation’ upon the earth. John was shown a book sealed with seven seals and he saw a strong angel proclaiming, "Who is worthy to open the book and break its seals?" (Rev.5:1&2). It was Jesus, described as the "Lion that is from the tribe of Judah, the Root of David" who "had overcome so as to open the book and its seven seals," (v.5). What then is described in the remaining chapters of the book of Revelation, the Apocalypse, are the events which apply to the time of "great tribulation" and those which apply to the separate and subsequent time of the wrath of God and "wrath of the Lamb" being poured out, (Rev.6:17) - the ‘day of the Lord,’ and also telling us of the events that culminate in a new heaven and a new earth. 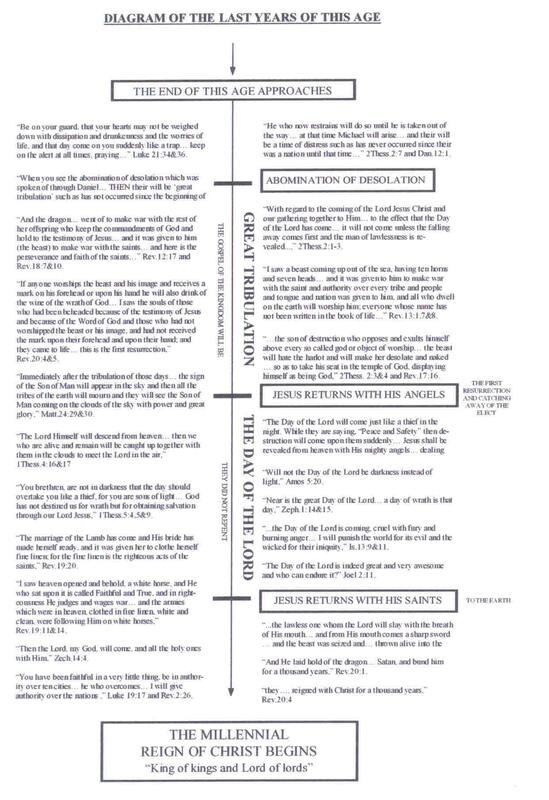 To correctly distinguish between the ‘great tribulation’ and the ‘wrath of God’ we need to first of all note that there are two separate periods being described. The first separate period we see in the ‘Revelation’ is ascribed to Satan "having great wrath, knowing he only has a short time," (Rev.12:12). This is the ‘great tribulation’. During this time we see that Satan’s anger is directed mainly at the "saints", who are still on the earth at this time, whilst he beguiles the whole world who worship him, Satan being personified in a man who is described as the "beast". (Note 14: The ‘Revelation’ describes a scarlet beast with seven heads and ten horns, (Rev.17:3), the heads representing seven kings, (v.10), and the horns also representing kings, (v.12). This political system appears to be personified in a man, an eighth king who is also one of the seven, (v.11). This man is also referred to as ‘the beast’, (Rev.19:20), to whom Satan will give "his power, and his throne and great authority," (Rev.13:2).) Only those whose names are "written in the book of life of the Lamb, slain from the foundation of the world," will not worship this man, (Rev.13:7&8). The other separate time described in the ‘Revelation’ tells of God’s wrath being poured forth upon this world after a "great multitude, that no one could count, from every nation and all tribes and peoples and tongues" were found in heaven, "standing before the throne and before the Lamb, clothed in white robes," (Rev.7:9). John is told that "these are the ones who come out of the great tribulation", (Rev.7:14), which we see is the period before the ‘wrath of God’ is poured out. As to the separate period when "the great day of Their wrath has come" (Rev.6:17), twice John sees seven events which make up this "great day" of the wrath of God and of the Lamb; events which have similarities one to the other suggesting that they are telling of the same seven times of judgement. The judgements of God are described for us once by the blowing of "seven trumpets", (Rev.8:2), and again by "seven bowls of the wrath of God" being poured forth, (Rev.16:1). During these judgements repentance is not found, (Rev.9:20&21 and Rev.16:9&11), despite the severity of God’s wrath. The first trumpet sounded and "hail and fire, mixed with blood... were thrown to the earth and a third of the earth was burnt up, and a third of the trees were burnt up and all the green grass was burnt up," (Rev.8:7). The second trumpet sounded and something "like a great mountain burning with fire was thrown into the sea and a third of the sea became blood and a third of the creatures which were in the sea and had life, died, and a third of the ships were destroyed," (Rev.8:8&9). The third trumpet sounded and "a great star fell from heaven burning like a torch, and it fell on a third of the rivers and on the springs of waters; and the name of the star was called ‘Wormwood’; and a third of the waters became wormwood and many men died from the waters because they were made bitter," (Rev.8:10&11). The fourth trumpet sounded and a third of the sun and a third of the moon and a third of the stars were smitten so that a third of them were darkened and the day might not shine for a third of it and the night in the same way," (Rev.8:12). Before the sounding of the rest of the trumpets an eagle flying in midheaven says "with a loud voice, ‘Woe, woe, woe, to those who dwell on the earth because of the remaining blasts of the trumpet of the three angels who are about to sound,’" (Rev.8:13). The three ‘woes’ are the events which are announced by the last three trumpet blasts. The fifth angel then sounded and "a star from heaven which had fallen to the earth" was given the key of "the bottomless pit" and he opened it. "Smoke went up out of the pit, like the smoke of a great furnace and the sun and the air were darkened by the smoke of the pit." "Out of the smoke came forth locusts upon the earth and power was given to them as scorpions have power." "They were told that they should not hurt the grass of the earth, nor any green thing, nor any tree, but only the men who do not have the seal of God on their foreheads." (Rev.9:1-4). Before the wrath of God began John saw 144,000 sealed, (a perfect number - 12x12x10x10), from "every tribe of the sons of Israel," (Rev.7:3-8). A remnant from the whole house of Israel will go through, but not be touched by the wrath of God. As far as the rest of mankind who find themselves upon the earth at this time, these locusts "were not permitted to kill anyone, but to torment for five months, and the torment was like the torment of a scorpion when it stings a man." "In those days men will seek death and will not find it; and they will long to die and death flees from them," (Rev.9:5&6). This is the first "woe", (v.12). Then the sixth angel sounded and "four angels who are bound at the great river Euphrates" and who "had been prepared for the hour and day and month and year, were released so that they might kill a third of mankind," (Rev.9:13-15)! Then John saw horsemen and the "armies of the horsemen was two hundred million" and "a third of mankind was killed by... the fire and the smoke and the brimstone which proceeded out of the mouths" of the riders, (Rev.9:17&18), and "the rest of mankind did not repent," (v.19). It is an amazing fact that despite such judgement "the rest of mankind who were not killed by these plagues did not repent of the works of their hands, so as not to worship demons, and the idols of gold and of silver..!" (Rev.9:20). Nor did they repent of their "murders, nor of their sorceries, nor of their immorality, nor of their thefts," (Rev.9:21). No repentance is found (Note 15: Although not dealt with in this booklet it needs to be noted that many consider the ‘two witnesses’ to be a type of the Church because they are taken up into heaven in a similar way to the Church being caught away to be with the Lord in the air. However, it needs to be noted that the appearance of the ‘two witnesses’ is very definitely during the time of God’s wrath being poured out and therefore after the Church has already been taken from the earth. These ‘witnesses’ are also referred to by the prophet Zechariah, (Zech.4), for the ‘Revelation’ describes the two witnesses as "the two olive trees and the two lampstands that stand before the Lord of the earth" which are same descriptions as the "two anointed ones who are standing by the Lord of the whole earth" that Zechariah sees. I suggest the ‘rest’ of Jerusalem at this time consists only of those who are part of the 144,000 of the twelve tribes of Israel who are sealed, for they are the only ones on earth at that time who able to glorify God.) during the day of the Lord! Before the seventh angel sounded, "two witnesses" (Note 16: Although not dealt with in this booklet it needs to be noted that many consider the ‘two witnesses’ to be a type of the Church because they are taken up into heaven in a similar way to the Church being caught away to be with the Lord in the air. However, it needs to be noted that the appearance of the ‘two witnesses’ is very definitely during the time of God’s wrath being poured out and therefore after the Church has already been taken from the earth. These ‘witnesses’ are also referred to by the prophet Zechariah, (Zech.4), for the ‘Revelation’ describes the two witnesses as "the two olive trees and the two lampstands that stand before the Lord of the earth" which are same descriptions as the "two anointed ones who are standing by the Lord of the whole earth" that Zechariah sees.) are seen, who have power "to shut up the sky, in order that rain may not fall during the days of their prophesying; and they have power over the waters to turn them into blood and to smite the earth with every plague as often as they desire," (Rev.11:3&6). These witnesses, "when they have finished their testimony," are killed by the ‘beast’, who the whole world will worship, and their dead bodies lie "in the street of the great city (Note 17: In the ‘Revelation’ the description ‘great city’ is used to refer to both Jerusalem and to Babylon.).... where also their Lord was crucified," (v.8) - Jerusalem. For three and a half days "those who dwell on the earth will rejoice over them and make merry and they will send gifts to each other because these two prophets tormented those who dwell on the earth," but then "the breath of life from God will come into them" and they will "rise up into heaven in the cloud" as their enemies behold them, (v.9-12). John describes that, "In that hour there was a great earthquake and a tenth of the city fell and seven thousand people were killed in the earthquake and the rest (Note 18: I suggest the ‘rest’ of Jerusalem at this time consists only of those who are part of the 144,000 of the twelve tribes of Israel who are sealed, for they are the only ones on earth at that time who able to glorify God.) were terrified and gave glory to the God of heaven," (Rev.11:13). This is the second ‘woe’, (v.14). Then the seventh angel sounded, but this portion of the ’Revelation’ tells little of the effect of this trumpet, nor does it give details of the third woe which was yet to come. Rather, we are told that a voice was heard in heaven saying, "The kingdom of the world has become the Kingdom of the Lord and His Christ and He will reign forever and ever," (Rev.11:15). All we are told at this part of the ‘Revelation’ is that the wrath of God is over and the Lord "has begun to reign" as King of the whole world, (v.17). The next verse causes confusion in the understanding of many Bible readers because the King James Version and other translations of Scripture now quote the twenty four elders in heaven as saying at this time, "Thy wrath has come", (present tense) suggesting this it is a result of the seventh angel sounding, (v.18). However, the Greek text puts this in the past tense, "Thy wrath came", (past tense), placing in the past the events which they declare the Lord has done, rewarding His bond servants the prophets, the saints and those who fear God, and destroying those who "destroy the earth," (Rev.11:18). We are given more information later in the ‘Revelation’ to tell us just what this last trumpet judgement brought. To correctly understand the book of Revelation the reader needs to note that the vision goes back in time and repeats the same events again but with differing detail. Before the ‘Revelation’ reveals more detail of the ‘day of the Lord’, it tells more about the time preceding this when the saints are still on the earth; a time when they will be persecuted yet will still overcome, (Rev.12&13). It tells of the rise of a beast from the sea (of nations), a worldly political alliance headed up by a man whom the whole world will worship, (Rev.13:8). It is a time during which no one will be able to buy or sell without his mark, "the name of the beast, or the number of his name," (v.17). These are events which will precede the coming "wrath of God" which the ‘Revelation’ goes on to describe, this time represented by "seven golden bowls full of the wrath of God", (Rev.15:7), poured out by seven angels into the earth, (Rev.16:1). Before judgement, however, there is always mercy and the gospel of the Kingdom will be preached by the Church before the coming of the ‘great day of the Lord’. In confirmation of this, before the "wrath of God" is described, John sees an angel (Note 19: We know that the gospel is proclaimed by the Church yet it seems that angelic assistance, even leading, is required, even if we are unaware of it.) "having an eternal gospel to preach to those who live on the earth, and to every nation and tribe and tongue and people," (Rev.14:6). What will then follow will be the "hour of His judgement," (v.7). Here we begin to see the end-time ministry of the Church being disclosed. Despite great persecution the true Church will be used to proclaim the good news of the Kingdom well aware of the fate that awaits the end-time generation. We see an angel with a sickle reaping "because the hour to reap had come, because the harvest of the earth was ripe," (v.15). This is the harvest at the end of the age of which Jesus foretold, (Matt.13:30); the resurrection and catching away of the saints. Then in contrast this is followed by another angel with another sickle, to gather "the vine of the earth and throw them into the great wine press of the wrath of God," (v.18&19)!!! Once more we see the scene "in heaven" where those who "had come off victorious from the beast and from his image and from his name" are singing the song of Moses, (Rev.15:1-3), as the wrath of God begins! Here we see the Church in heaven for the saints are not destined for wrath, (1Thess.5:9), yet we must be clear - the Church is still present when the ‘beast system’ rules the world. The first angel then poured out his bowl and it "became a loathsome and malignant sore upon the men who had the mark of the beast and who worshipped his image," (Rev.16:2). The second angel poured out his bowl "into the sea and it became blood like that of a dead man and every living thing in the sea died," (v.3). The third angel poured out his bowl "into the rivers and the springs of waters and they became blood," (v.4). We might find it difficult to comprehend these judgements but the "angel of the waters" declares, "Righteous art Thou, who art and who wast, O holy One, because Thou didst judge these things for they poured out the blood of the saints and prophets and Thou hast given them blood to drink. They deserve it!" (Rev.16:5&6). "Yes, O Lord God, the Almighty, true and righteous are Thy judgements," (v.7). We may not fully understand them but we can trust the justice of our Judge. Then the fourth angel poured out his bowl "upon the sun and it was given to it to scorch men with fire and men were scorched with fierce heat and they blasphemed the Name of God who has the power over these plagues" - yet "they did not repent," (v.8&9). Next, the fifth angel poured out his bowl "upon the throne of the beast and his kingdom became darkened and they gnawed their tongues because of pain" and they still did "not repent of their deeds", (v.10&11). The sixth angel poured out his bowl "upon the great river, the Euphrates, and its water was dried up that the way might be prepared for the kings from the east," (v.12). Before the seventh angel pours out his bowl, unclean spirits like frogs, coming out of the mouths of the dragon, the beast, and the false prophet, perform signs which "go out to the kings of the whole world to gather them together for the war of the ‘great day of God the Almighty’, gathering them together to the place which in Hebrew is called Armageddon," (Rev.16:13-16). ‘Armageddon’, so often referred to, even by unbelievers, and held up as an end-time war that might come upon the world at any time, is in fact the last event of the coming judgement of the ‘day of the Lord’. It cannot happen at any time because it occurs after Jesus has come for His saints and it does not foretell of the end of the world, as most of those who mention this war might fear. Indeed, ‘Armageddon’ is not even the place of the battle but only the place where the beast and his forces gather. Armageddon is the gathering place of the armies of the world. This war, we will see, is the third woe that the earlier vision had not disclosed and will be as a result of the seventh bowl of wrath being poured out. The prophet Joel prophesies of this same war, which will take place in "the valley of Jehoshaphat," (Joel 3:2), now called Kidron Valley at Jerusalem, 55 miles south of the gathering place of Armageddon. Joel prophesies of this judgement, God saying through him, "Put in the sickle, for the harvest is ripe. Come, tread, for the wine press is full. The vats overflow, for their wickedness is great. Multitudes, multitudes in the valley of decision!" (Note 20: Literally, 'God's verdict'.) (v.13&14). The reference, by way of description, to the ‘wine press’ we will see is repeated when this particular time of judgement is described again. So the seventh angel poured out his bowl "upon the air and a loud voice came out from the temple, from the throne, saying, ‘It is done,’" (Rev.16:17). Once more the details of this seventh judgement are not yet described. This will follow later. But John does tell of a subsequent "great earthquake, such as there had not been since man came upon the earth," (Rev.16:18), which split the "great city" (Jerusalem) "into three parts," (v.19). This earthquake will happen at the coming of Jesus to the earth, to the Mount of Olives, as prophesied by the prophet Zechariah, when the land around Jerusalem will be "changed into a plain," (Zech.14:4-10). Before the final details of this seventh trumpet - this seventh bowl of wrath - this third woe, are given, once more the ‘Revelation’ goes back in time and tells of events that will happen during the "great tribulation" and afterwards when the saints will be in heaven, joined then "in marriage", as the Lamb is joined to His bride, (Rev.17,18&19), the Church. We are also introduced to ‘Mystery Babylon’ and her judgement; not directly judged by God, but by the ‘beast’ and its ‘ten horns’ who will "hate the harlot and will make her desolate and naked and will eat her flesh and burn her up with fire, for God has put it in their hearts to execute His purpose," (Rev.17:16). Most Christians in the past have believed that ‘Mystery Babylon’ is the apostate Christian church but many differing ideas exist, even that the ‘Revelation’ describes two Babylon’s; a religious and a political one. This latter idea comes from the fact that her demise will coincide with economic and commercial demise. However, the ‘Revelation’ does tell us that ‘Mystery Babylon’ is the "mother of harlots and of the abominations of the earth," portrayed as a woman "drunk with the blood of the saints and with the witnesses of Jesus," (Rev.17:5&6), and before her judgement she rides on the back of the beast. That she is affiliated with the religious systems of the world seems not in doubt. Certainly the Church is still found linked with her before her judgement as an angel is heard to say, "Come out of her My people," (Rev.18:4). We need to note that Babylon is judged before the wrath of God comes, during the time of "great tribulation", for all present day world religions - all those who worship that which is other than the true God - must change their allegiance so as to worship the beast, for when Babylon is fallen "all who dwell on the earth will worship the beast, whose name was not written in the book of life of the Lamb (Christians) slain from the foundation of the world," (Rev.13:8). Once more we can see the true Church, the saints, are still on earth when this worship of the beast occurs. And so the Lord tells the saints to "Come out of her My people, before "in one day her plagues will come, pestilence and mourning and famine and she will be burned up with fire," (Rev.18:4&8). This judgement, carried out by the beast with ten horns, will at that same time cause the economy of the world to be brought under his power and control. As a result of the fall of Babylon economic disaster occurs, still during the time of ‘great tribulation’, for it will then enable the beast to have control of the whole world that none might buy or sell without his mark. This must occur before the ‘day of God’s wrath’ because in this rejection of the worship of the beast and the taking of his mark is "the perseverance of the saints, who keep the commandments of God and their faith in Jesus," (Rev.14:12). This will be confirmed later by perhaps one of the most important scriptures which tells us that the true Church is still on earth during the ‘great tribulation,’ the time of the beast, as those who are beheaded because they did not worship the beast or his image, and have not received the mark upon their forehead and upon their hand, are part of the "first resurrection" (Rev.20:4&5). The description of the events that result from the seventh angel sounding; the seventh bowl of wrath being poured forth; and the third woe, are described next in the book of ‘Revelation’. The detail of these events, we have already noted, were withheld when first seen by John. Unlike Jesus’ coming on the clouds with great glory - with His angels - for His saints - this second aspect of Jesus’ second coming is when He comes to the earth with His saints. Immediately before this, however, John sees " a great multitude in heaven," (Rev.19:1), His bride, "for the marriage of the Lamb has come," (Rev.19:7). "His bride" we are told "has made herself ready" and she is clothed "in fine linen, bright and clean." It is explained that "the fine linen is the righteous acts of the saints," (Rev.19:7&8). The marriage of the Lamb takes place in heaven during the ‘day of the Lord’s anger being poured out upon the earth. Then John saw "heaven opened and Jesus; He who "is called ‘Faithful and True’" sat on a white horse to judge and make war; and He who "is called the Word of God", [Jesus], was followed on white horses by "the armies which are in heaven "clothed in fine linen, white and clean," [the saints] (Rev.19:7-14). Jesus is coming to the earth with His saints. Astonishingly, the "beast and the kings of the earth and their armies" have "assembled to make war against Him who sat upon the horse and against His great army," (Rev.19:19), but Jesus "treads the wine press of the fierce wrath of God," (v.15) as "all the birds that fly in mid heaven" are called to "assemble for the great supper of God," (v.17), "in order that they may eat the flesh of kings and the flesh of commanders and the flesh of mighty men and the flesh of horses," (Rev.19:18)!!!!! This supper takes place whilst Jesus seizes the beast and false prophet and throws them "alive into the lake of fire which burns with brimstone" the remainder of those gathered for this war being "killed with the sword which came from the mouth of Him who sat upon the horse [Jesus], and all the birds were filled with their flesh, (Rev.19:20&21). This is the event which Paul refers to when he describes the "lawless one... whom the Lord will slay with the breath of His mouth and bring to an end by the appearance of His coming," (2Thess.2:8). This is the third woe. John had already heard that "the wine press was trodden outside the city, and blood came from the wine press up to the horses bridles for a distance of two hundred miles," (Rev.14:20). This is the time the seventh angel sounds and the voice from heaven is heard saying, "The kingdom of the world has become the Kingdom of the Lord and of His Christ, and He will reign forever and ever," (Rev.11:15). This is the beginning of the millennial reign of Christ. Jesus has begun to reign as King over all the earth! This is also the time when the seventh angel pours out his bowl and a "great earthquake" splits Jerusalem in three parts, just as Zechariah prophesied, (Rev.16:18&19a and Zech.14:4&5); when Jesus sets His feet again on the Mount of Olives. As the judgement of the day of wrath draws to a close "an angel comes down from heaven having the key of the abyss (Note 21: Abyss in Greek is "abussos" meaning "bottomless" and is sometimes translated "bottomless pit".) and a great chain in his hand" and lays "hold of the dragon, the serpent of old, who is the devil and Satan and binds him" throwing "him into the abyss" and shuts it and seals it over him, (Rev.20:1-3). This will be Satan’s prison for one thousand years, (v.7), whilst Jesus reigns as King over all the earth. In the first seven verses of the twentieth Chapter of the book of the ‘Revelation’ six times reference is made to a period of one thousand years, (Rev.20:1-7). We are told that Satan will be bound for one thousand years, unable to "deceive the nations any longer until the thousand years were completed, (v.2&3). "When the thousand years are completed," however, "Satan will be released from his prison," (Rev.20:7). We are also told of the resurrection of those who had "been beheaded because of the testimony of Jesus and because of the Word of God", that "they came to life and reigned with Christ for a thousand years, (Rev.20:4). This means they must have been alive during the time when the beast or his image were worshipped; (Note 22: Those who hold to a doctrine that the (first) resurrection of those who have died in Christ and the concurrent catching away of the saints, all to meet the Lord in the air, occurs before the ‘great tribulation’ and the rise of the ‘beast’, must contend with this scripture that tells us that there are those who are part of the first resurrection who were alive during this time.) when he causes many to receive "the mark upon their forehead and upon their hand," and concurs with the fact that the ‘first resurrection’ is after the ‘great tribulation’. This, of course, is the resurrection of the righteous (Note 23: Jesus spoke of two resurrections, for "those who did good deeds, to a resurrection of life" and "those who committed evil, to a resurrection of judgement," (John 5:29). He also spoke on another occasion of the "resurrection of the righteous," (Luke 14:14). We see from the ‘Revelation’ that they are one thousand years apart.) which takes place when the Lord comes with His angels after the ‘great tribulation’. The ‘Revelation’ calls it the "first resurrection" (Note 24: By referring to this resurrection as the "first" this must indicate that there is a ‘second’.) and tells us the "rest of the dead did not come to life until the thousand years were completed," (v.5). That this is the ‘resurrection of the righteous’ is confirmed as we are told, "Blessed and holy is the one who has a part in the first resurrection" because "over these the second death has no power"; "they will be priests of God and of Christ and will reign with Him for a thousand years," (v.6). Although the events we have seen prophesied so far, those events which are described as the ‘day of the Lord’, they take place over a short period; 3½ years (Note 25: Although not the subject of this booklet, the ‘great tribulation’ and the separate period of the ‘day of God’s wrath’ each last 3½ years, making up the 70th week of Daniel’s seventy weeks, (Dan.9:24). See Appendix. Daniel prophesies that the saints are given into the hand of the ‘beast’ for a time, times and half a time; the 3½ years of the ‘great tribulation’, (Dan.7:25). 3½ years are left of Daniel’s 70th week of years during which God pours out His wrath upon the world. See ‘Trying to Understand the End of the Age’ by Colin Winfield.) in fact, but Peter explains to us that "one day is as a thousand years and a thousand years as one day," (2Pet.3:8). So it is that we begin to see that the ‘day of the Lord’ will actually last one thousand years. Although most prophecies speak of the aspect of judgement with which this day of a thousand years will commence, it is clear from Peter’s second letter that this ‘day’ is deemed to continue until "the heavens... pass away with a roar and the elements will be destroyed with intense heat, and the earth and its works... burned up," for Peter, having just explained that "one day is as a thousand years," explains that these things occur during the "day of the Lord," (v10). Agreeing with what Peter describes, John saw in the ‘Revelation’ this earth pass away after Satan was released from his abyss prison: "And I saw a new heaven and a new earth, for the first heaven and the first earth passed away," (Rev.21:1). When Satan is released, after being in chains for one thousand years, he amazingly is able to deceive the nations once again. We are told that he will gather the nations together again for war, surrounding the camp of the saints (Note 26: Ezekiel prophesies of the new temple and division of the land when Jesus comes to rule as King over all the earth. He tells us of the portion for the "prince" in addition to those for the twelve tribes of Israel, (see Ez.45:7&8 and Ez.48:1-29). The "camp of the saints" will be with their Lord.) and the beloved city, Jerusalem, "on the broad plain of the earth," (Rev.208&9). That the area around Jerusalem will then be a "broad plain" is foretold by Zechariah who tells us that when "the Lord will be King over all the earth" the land "will be changed into a plain" around Jerusalem, (Zech.14:9&10). We have already seen that this happens due to a "great earthquake" after God’s wrath "is done," as the Lord sets His feet "on the Mount of Olives," when He comes to the earth with His saints causing it to be split" in its middle from east to west," (Rev.16:17&18 and Zech.14:4,9&10). This time, when Satan is released from being held captive in the abyss, fire comes down from heaven and devours those gathered for war, the number of whom "is like the sand of the seashore," (Rev.20.8&9) and Satan is "thrown into the lake of fire and brimstone where the beast and the false prophet are also," (v.10). Satan is finally dealt with. Next, John sees a great white throne. Now is the time of the second resurrection, (Note 27: See notes 22 ,23 and 24.) after which John sees the dead "standing before the throne" to be judged "according to their deeds." "Death and Hades, who are obviously spiritual entities, are thrown into the lake of fire along with all those whose names were "not written in the book of life," (Rev.20:11-15). Paul speaks of this time, telling us that Jesus "must reign until He has put His enemies under His feet," and explains that the "last enemy that will be abolished, is Death," (1Cor.15:25&26). The ‘day of the Lord’ is finally over. A new heaven and a new earth awaits, (Rev.21&22), "in which righteousness dwells," (2Pet.3:13). What will it be like during the Reign of Christ? Scripture tells us many things about the time of Jesus’ reign upon the earth for one thousand years. Many misapply these prophecies to the age we are currently living in but, once more, we must rightly divide scripture if we are not to be misled as to our role now and in the days that lie ahead. Zechariah tells us that "the Lord will be King over all the earth; in that day the Lord will be the only one and His Name One." He tells us that "people will live in Jerusalem and there will be no more curse, for Jerusalem will dwell in security," (Zech.14:9&11). "Then it will come about that any who are left of all the nations that went against Jerusalem will go up from year to year to worship the King, the Lord of hosts, and to celebrate the Feast of Booths," or Tabernacles, (v.16). During Jesus’ reign on earth "it will be that whichever of the families of the earth does not go up to Jerusalem to worship the King, the Lord of hosts, there will be no rain on them... it will be a plague with which the Lord smites the nations who do not go up to celebrate the Feast of Booths," (v.18&19). It appears that the population upon the earth are ruled very firmly. The book of ‘Revelation’ tells us that when Jesus comes to the earth with His saints, that "He will rule them with a rod of iron," (Rev.19:15). In the letters to the seven Churches in Asia, at the beginning of the book of ‘Revelation,’ the Lord had promised those of the Church in Thyatira - those who overcome - that they would "have authority over the nations and... rule them with a rod of iron," (Rev.2:26&27). The Church will help the Lord to rule in that day. Here we see that the Churches role is not completed in this age but we have more to do in the age to come. Sadly, few Christians contemplate this. The word translated ‘rule’ is in fact ‘shepherd’ but we see a firmness necessary to oversee the nations in the day of the Lord’s reign, to ensure the nations have the peace and prosperity they need, for the shepherding is done with a "rod of iron." Isaiah prophesies of this day, telling us that "the mountain of the house of the Lord will be established as the chief of the mountains, and will be raised above the hills; and all the nations will stream to it, and many peoples will come and say, ‘Come, let us go up to the mountain of the Lord, to the house of the God of Jacob, that He might teach us His ways and that we might walk in His paths,’ for the law (or instruction) will go forth from Zion and the word of the Lord from Jerusalem, and He will judge between the nations and will render decisions for many peoples," (Is.2:2-4a). It will be a time of true peace, for the nations will "hammer their swords into plowshares and their spears into pruning hooks. Nation will not lift up sword against nation and never again will they learn war," (v.4b). Micah prophesies almost exactly these same words as Isaiah, (see Mic.4:1-3), going on to explain that each "will sit under his vine and under his fig tree with no one to make them afraid," (Mic.4:4). The Lord will "assemble the lame and gather the outcasts, even those whom He has afflicted," speaking of Israel, making "the lame a remnant and the outcasts a strong nation, and the Lord will reign over them in Mount Zion," (v.6&7). Joel foretells that the "mountains will drip with sweet wine and the hills will flow with milk and the brooks of Judah will flow with water and a spring will go out from the house of the Lord," (Joel.5:18). Ezekiel saw this, seeing water flowing from the house of the LORD, flowing "toward the eastern region" and "into the Arabah," flowing into the Dead Sea so that "the waters become fresh," (Ez.47:1-8). "Everything will live where the river flows," (v.9), and fishermen will stand beside the Dead Sea and from "Engedi to Eneglaim there will be a place for the spreading of nets. Their fish being according to their kinds, like the fish of the Great Sea" - the Mediterranean, (v.10). On the banks of this river which flows from the temple there will be "many trees on the one side and the other... for food. The leaves will not wither and their fruit will not fail. They will bear every month because their water flows from the sanctuary, and their fruit will be for food and their leaves for healing," (Ez.47:7&12). The prophecy of Ezekiel explains in detail the divisions of the land of Israel in that day, portions for the twelve tribes of Israel and a portion "for the Prince" (Jesus) with the holy allotment and the sanctuary of the house... in the middle of it," (Ez.48:21). The land will be apportioned "by lot to the tribes of Israel for an inheritance," (v.29), and the city of Jerusalem will be named, "YHWH-shammah" meaning "The Lord is there," (v.35). But this is not the only name that will be given to Jerusalem in that day. The word of the Lord to Zechariah tells us, "I will return to Zion and will dwell in the midst of Jerusalem. Then Jerusalem will be called the City of Truth and the mountain of the Lord of hosts, the Holy Mountain," (Zech.8:3). Zechariah then goes on to describe that "Old men and old women will again sit in the squares of Jerusalem, each man with his staff in his hand because of the multitude of days," and "the squares of the city will be filled with boys and girls playing in its squares," (v.4&5). The Lord explains through His prophet, Zechariah, that it is when He saves His people "from the land of the east and from the land of the west" that they "will live in the midst of Jerusalem and they will be My people and I will be their God in truth and righteousness," (Zech.8:7&8). But as Paul taught (Rom.9:27) it is only a remnant that will be saved, for it is at this time that the Lord says, "now I will not treat the remnant of this people as in the former days... for there will be peace for the seed, the vine will yield its fruit, the land will yield its produce, and the heavens will give their dew; and I will cause the remnant of this people [Israel] to inherit all these things," (Zech.8:11&12). Just as Israel were "a curse among the nations, O house of Judah and house of Israel, so I will save you that you may become a blessing," (v.13). In this day "the fast of the fourth, the fast of the fifth, the fast of the seventh, and the fast of the tenth months will become joy, gladness and cheerful feasts," as the inhabitants of many cities go one to another saying, "Let us go at once to entreat the favour of the Lord, and to seek the Lord of hosts I will also go." "So, many peoples and mighty nations will come to seek the Lord of hosts in Jerusalem and to entreat the favour of the Lord," and "in those days ten men from the nations of every language will grasp the garment of a Jew saying, ‘Let us go with you, for we have heard that God is with you,’" (Zech.8:19-23). Many Bible students wrongly place Israel’s full restoration as taking place in this age, before the Lord’s return, but this booklet has endeavoured to point out that the scriptures place this restoration as occurring after the wrath of God at the commencement of the ‘day of the Lord’. Paul explained in his letter to the Romans that some of natural Israel, Paul’s "kinsman according to the flesh," (Rom.9:3), had been broken off from the cultivated olive tree, and Gentile believers, "being a wild olive, were grafted in among Israel [who make up the other branches of the cultivated olive tree] and became partakers with them of the rich root of the olive tree," (Rom.11:17). In this way Paul explained the "partial hardening" that had "happened to Israel until the fullness of the Gentiles had come in," foretelling that those who "do not continue in their unbelief will be grafted back in again," (v.25&23). Although Israel were dispersed in part when Assyria captured Samaria, the capital city of the northern kingdom of Israel [also going by the name of Israel] in 721BC, and also when the southern kingdom, Judah, were taken into exile in Babylon by Nebuchadnezzer in 597BC, Jesus foretold of a further dispersion, as Judah, in part, had returned again to the land before Jesus was born. Jesus prophesied that there would once again be "great distress upon the land and wrath to this people and they will be led captive into all nations, and Jerusalem would be trampled underfoot by the Gentiles until the times of the Gentiles be fulfilled," (Luke 21:23&24). Although, in the last decades we have seen natural Israel being gathered "from many nations," after being dispersed for nearly 2000 years, we know that it is not until after the war prophesied by Ezekiel that the Lord will "restore the fortunes of Jacob and have mercy on the whole house of Israel," (Ez.38:8 and 39:25). It is only then that "they shall forget their disgrace and treachery which they perpetuated against the Lord; when they live securely on their own land with no one to make them afraid," (v.26). This is the prophesied future Israel, that the whole house of Israel will return to the land but when Jesus returns for His Church, natural Israel is still cut off from the olive tree for they will "mourn for Him" when He comes "with the clouds," (Rev.1:7), along with all the other nations. (Note 28: That some of the nation of Israel are involved is made clear in this verse in Rev.1:7 which states that the nations include "even those who pierced Him." Zechariah foretells of this same occasion when the Lord declares through him, "They will look on Me whom they pierced; and they will mourn for Him, as one mourns for an only son, and they will weep bitterly over Him, like the bitter weeping over a first-born," (Zech.12:10). ) We have already seen that the Lord seals 144,000 from the twelve tribes of Israel before the day of His wrath came, and we can see why, because natural Israel will have to go through this time of judgement before they are grafted back into the cultivated olive tree. At this time of writing there is much wrong expectation amongst Christians who wrongly expect the whole of Israel to return to the land before Jesus returns. Other scriptures make it clear as to when the restoration will take place and that it will be when Jesus will be in their midst, dwelling in Zion. Ezekiel prophesies that the Lord "will take the sons of Israel from among the nations... and gather them from every side and bring them to their own land and will make them one nation in the land, on the mountains of Israel, and one king will be King for all of them [Jesus] and they will no longer be two nations, and they will no longer be divided into two kingdoms," (Ez.37:21&22). Once more we can see that scripture places Israel’s complete restoration to the land in the time when Jesus has returned to the earth to be their King and so is in their midst. Ezekiel declares the word of the Lord, "My servant David [Jesus] will be King over them and they will have one shepherd and they will walk in my ordinances and keep My statutes, and observe them. "And they will live on the land that I gave to Jacob My servant, in which your fathers lived; and they will live on it, they, and their sons, and their son’s sons forever, and David [Jesus] My servant shall be their Prince forever," (Ez.37:24-26). God says that He will set His sanctuary in "their midst forever," and that His "dwelling place also will be with them, and He will be their God and they will be His people, and the nations will know that He is the Lord who sanctifies Israel, when His sanctuary is in their midst forever," (v.27&28). It is only then, when the Lord is dwelling with Israel, that they come into the New Covenant that we who belong to the Lord have come into in this age, God saying, "I will make a covenant of peace with them and it will be an everlasting covenant with them," (v.26). All those who come into the New Covenant in this age, whether Jew or Gentile, become part of the Church, the Body of Christ. Both then become part of the cultivated olive tree, for even the unregenerate Jew is presently broken off. Anyone who is part of natural Israel and who comes into this covenant in this age becomes part of the Church, the Body of Christ, and they will not go through the time when God’s wrath will be poured out. However, a remnant of natural Israel is destined to go through the ‘day of the Lord’; the day of the wrath of God. So it is that we see that it is after this time that Israel is "taken from the nations and gathered "from all the lands," (Ez.36:24), and brought back into their own land, and then - at last - they also will enter the New Covenant. This is when, God says to the "house of Israel" through Ezekiel, "I will give you a new heart and put a new spirit within you, and I will remove your heart of stone from your flesh and give you new heart. And I will put My Spirit within you and cause you to walk in My statutes, and you will be careful to observe My ordinances," (Ez.36:26&27). Jeremiah prophesies of this same New Covenant, telling us to proclaim, "O Lord save Thy people, the remnant of Israel," (Jer.31:7), and through Jeremiah God declares, "Behold, I am bringing them back from the north country and I will gather them from the remotest parts of the earth," (v.8). The Lord tells us to "declare to the coastlands afar off, and say, ‘He who scattered Israel will gather him,’" (Jer.31:10), and goes on to say, "Behold days are coming... when I will make a new covenant with the house of Israel and the house of Judah," (v.31). "This is the covenant which the Lord will make with the house of Israel after those days," (v.33), [the days of the return of the whole house of Israel]. "I will put My law within them and on their heart I will write it; and I will be their God and they shall be My people. And they shall not teach again, each man his neighbour and each man his brother, saying, ‘Know the Lord,’ for they shall all know Me, from the least to the greatest of them... for I will forgive their iniquity and their sin I will remember no more," (v.33&34). That this is the same covenant that believers, the true Church, have already come into in this age, is confirmed by the teaching we find in the letter to the Hebrews where this prophecy of Jeremiah is quoted as regards the covenant we, the Church, have already come into, (see Heb.8). But when natural Israel come into the New Covenant it is when "the city of Jerusalem will be built for the Lord from the Tower of Hananel to the Corner Gate" just as Zechariah prophesies will happen, when Jesus has returned to the Mount of Olives, (Cross reference Jer.31:38-40 and Zech.14:9&10). If the whole house of Israel were to come into the New Covenant in this age they would be part of the Church and there would be no nation of Israel to populate the earth in the millennium. So it is that we see that it is during the fullness of the ‘day of the Lord’ that natural Israel come into the New Covenant that we, the Church, have already come into. The Church in the ‘day of the Lord’ will then have their immortal bodies, having already been raised from the dead. As we draw this study to a close we see the plan and purpose of God going beyond this present age into the next as the ‘day of the Lord’ arrives, and then beyond to when there will be a New Heaven and a New Earth. Only then will the Lord Jesus "deliver up the Kingdom to the God and Father, when He has abolished all rule and all authority and power, for He must reign until He has put all His enemies under His feet," (1Cor.15:24&25). Then "the Son Himself will be subjected to the One who subjected all things to Him, that God may be all in all," (v.28). From this study we see that role of the Church, the Body of Christ, is not restricted to this age, for when we have our spiritual bodies, after the resurrection, (1Cor.15:42-44), we will come back to the earth to reign with the Lord. Presently, we are not living at the end of the world but rather at the end of this age. Our role as the Church goes on beyond this age yet our actions now will dictate our future role. Our life now is preparation for what lies ahead. Dependant on our present actions our future individual role is determined. At the end of this age we, the Church, will come before the bema-seat of Christ, (Note 29: Distinct from the post-millennial "Great White Throne" judgement, the Church will stand before another judgement seat. In Rom.14:10 it is called the "judgement-seat of God" and in 2Cor.5:10 it is called the "judgement-seat of Christ." The word for ‘judgement-seat’ is ‘bema-seat’ which was the name given for a raised platform in the Greek assemblies and law-courts or at the games where crowns were given to the winner of the races and other events.) to receive our crowns; crowns being symbols of rewards - of distinctions earned. Little is told of our role in the millennial reign of Christ but he who has been "faithful with a few things" the Lord "will put in charge of many things" (Matt.25:23). He who has "been faithful in a very little thing" will be "in authority over ten cities" or "five," dependant upon our present faithfulness, (Luke 19:17&18). The privilege we have, being part of the true Church, is that we are part of that company who are part of the first resurrection; "over these the second death has no power," and they "will reign with Him [Jesus] for one thousand years," (Rev.20:6). All those who are not saints when the Lord returns but subsequently make it through the day of the Lord’s anger and wrath will still be mortal; they will still reproduce and die. The Church which is His body, however, will be already immortal and will rule with Him. We have seen that the ‘day of the Lord’ will come with the most awesome judgement. Unfolding prophesies would suggest that it is coming upon this present evil generation. The world is oblivious to the horror that awaits them yet the Lord wishes for none to perish but rather for all to come to repentance, (2Pet.3:9). Soon the Lord will put His true Church to action, to proclaim the good news of the Kingdom as a witness to all the nations before the end of this age comes. It will bring great persecution upon the true Church as Satan opposes them in this last battle to bring forth Truth before Jesus returns as the Judge. In love, many Christians will lay down their lives in this time of harvest. So it is that we are being prepared at this time and the motives of our hearts are being tested but Jesus warned us that these are days of great deception with false prophets, false signs and false wonders. The need for spiritual wisdom, spiritual understanding and all discernment has never been greater, but these are all ours if we ask for them from the Holy Spirit who has been given to us as our Helper, Teacher and Guide in this age in which we live. We are not alone. May we each therefore look to Him and ask that we might be a people, prepared and ready to work with the Lord of hosts in this awesome hour which is fast coming upon us and also be prepared for our future role in the age to come. I feel the message of this book is of such importance that it would not be complete without there being a challenge to the true Church, those that make up the body of Christ, whether they are presently within a denominational structure, which we unscripturally call ‘Church’, or not. The Church is being prepared in these times, firstly to witness to the world about the soon coming judgement of the 'Day of the Lord' and secondly to explain that God has made a 'way' of escape. Jesus is the 'way' of escape and God alone delivers us from the power of darkness and translates us to the kingdom of His Son. Therefore, given the importance of this message, what kind of Church is empowered to deliver this message effectively, lovingly and with the associated power of signs and wonders that accompany good news. The Church [in its current form of understanding in the world] is weak through sin, unbelief and the division of denominations and fellowship doctrines. The conformity to earthly systems of men, hierarchy, old covenant teachings, religious spirits and control of men, have robbed the church of its true power, true status and true head, which is all in Jesus. The Church is therefore asleep and ignorant of the times. The denominational church system’s emphasis on 'commitment to' something, rather than ‘surrender and abandonment to God’, has effectively denied Jesus the pre-eminence that He is worthy to receive, and it is compulsory for the end-time Church to accept and confess that Jesus is their Lord and Master and absolute head above all men and religious systems. We do not need to commit to something but surrender to God. So the first step for the true Church is to accept the need for change. The second step is repentance for sin and conforming to men and their systems and not to Christ. The third step is complete surrender and abandonment to God - His headship and His will. The final steps don't matter because after abandonment it's ‘all Jesus’ and we are led by His Spirit to fulfil His will in witnessing to the world with power. The result is 'a way of escape' from the soon coming judgement of the world for both ourselves and those who receive the word of life. The acceptance of sin is also the acceptance of coming judgement according to the scriptures and the world will soon learn the lesson of that. Jesus is the only hope for this already judged world. The true Church in its true form is the only vessel that God has appointed to take the good news that Jesus has made a way of escape and by repentance and surrender to Him we are both forgiven and know the sure promise of everlasting life. The question is, who will listen? and who will follow? Quotations in this booklet are from the American Standard translation.